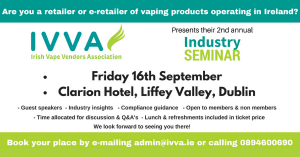 The Irish Vape Vendors Association is looking forward to welcoming independent retailers and e-retailers to their 2nd annual Industry Seminar, to be held at the Clarion Hotel, Liffey Valley, Dublin in September 16th. The day promises attendees industry insights, guest speakers, compliance guidance and discussion and networking that should prove invaluable for vape shops and online vendors alike. Booking forms can be downloaded in PDF form here and returned via e-mail to admin@ivva.ie to book your place. Directions and more information about the Clarion Hotel, Liffey Valley, can be found here.